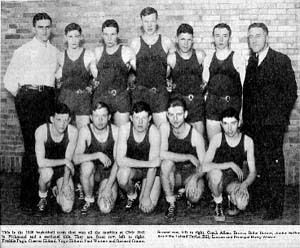 Sirens blew, no one slept and 1- basketball players and the coach Al Brown were the toast of the town as Greens Fork won its lone Richmond Sectional Basketball title in 1936. Rex Ellis led the rampaging Demons as they swept by Richmond, 34-20, for the championship. Ellis scored 16 big points in the final game while Bill Lintner tossed in eight and Virgil Hilliard, five. Actually, Greens Fork made shambles of Richmond after controlling the opening tip-off. Not one Richmond player reached double figures as a stalwart Demon defense kept the county seat team at bay. To reach that championship game, Greens Fork romped by Boston, 32-18 and belted Webster, 38-14. But the glory of the demons did not end there as they traveled to Muncie for the regional; and defeated the favored Muncie Bearcats in the afternoon, 25-22. The tournament trail finally ended on Saturday night when New castle, listed in the top five in the state that year, walked off with a 33-20 victory. In the sectional, Ellis tossed in a total of 37 points in three games on 15 field goals and seven free throws. Other starters were Fred Pugh, Junior Saffer and Leland Taylor. Saffer only scored two points in the sectional championship game but controlled the bankboards, although far shorter than his Richmond opponent Dietrick. Brown said before the sectional that his Greens Fork Demons were a small team but one of the scrappiest he had ever coached. He predicted that Greens Fork would win its first sectional, unless the Demon shooters hit an extremely cold game. He called balance on the team its most valuable asset. Other players on the sectional team were Gayle Gilmer, Noval Kutter, William Butner, Paul Winters and Richard Cranor.